Spacious four/five-bed detached house located in a quiet cul de sac position with ample car parking space, presented to the open market in good condition both inside and out. 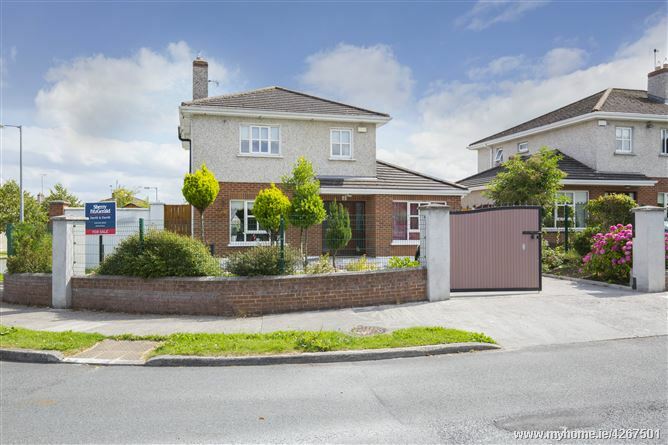 Located in a very popular development with easy access to the N4 motorway, new link road and close to town centre. The ground floor accommodation comprises on the entrance hallway with laminate flooring, lving room which overlooks the front garden with laminate flooring open cast iron fireplace with timber surround and double doors to the kitchen/dining room. Impressive fully fitted kitchen with wall and floor units, breakfast counter, laminate flooring, and off the dining area is patio doors to the rear patio area and garden. Utility room and guest WC. Family room that would also suit a bedroom with adjoing shower room. The first floor comprises of a spacious landing with hotpress, four bedrooms with master ensuite which has fully tiled shower cubical and electric shower. The main family bathroom is fully tiled with a three piece suite. The exterior of this home comes with concrete drive way offering ample parking and well-maintained gardens to front and rear. Laminate flooring, coving, alarm and phone point. Laminate floor, coving, open cast iron fireplace with timber surround, TV point, solid fuel stove, double doors to kitchen/dining room, timber panel shelving. Impressive fully fitted kitchen with appliances, laminate floor, bar counter, tiled wall, patio doors to south facing rear garden. Laminate floor, counter, plumbed, built in shelving. WC, wash hand basin, wall and floor tiling. Wash hand basin, full tiled shower cubicle, laminate floor. Carpet, hotpress, access to attic, stira stairs. Laminate floor, built in presses. Laminate floor, phone point, built in presses. Laminate floor, built in wardrobes. Laminate floor, built in wardrobes and shelving. Fully finished corner shower with electric shower, WC, wash hand basin. Three-piece suite, wall and floor tiling. From Mullingar travel out eh Ballymahon road and turn right at Ardleigh round about. Take the left turn into Ardleigh Vale and the property is straight in front of you with a Sherry FitzGerald Davitt & Davitt sign.